1.) Storyline Online - This great website has famous actors and actresses reading quality children’s fiction. You get to see all of the pictures, just as if you were listening to a live read aloud. This is a great way to expose students to quality read alouds – perfect for ESL students and low income families who may not have access to English books being read aloud. 2.) Mighty Book – This website has great, animated stories for kids to listen to. This is also a great way to expose students to quality read alouds – perfect for ESL students and low income families who may not have access to English books being read aloud. 3.) Between the Lions – This website is based on the PBS show Between the Lions. It has great stories, with the words underneath. for students to watch. There are also games based on these stories. 4.) Bitesize – This UK based website has fabulous reading games and lessons on a variety of topic. The KeyStage 1 site has lessons on phonics, spelling, alphabetical order, and rhyming words. The KeyStage 2 site has lessons on deductions, poetry, dictionary and finding information. 5.) We Give Books – This website is owned by Pearson Foundation, and has hundreds of e-books available for kids to read for free. In addition, the foundation donates books to kids in need around the world for all of your time spent on this site. You can sort the books by content and age appropriateness. 6.) Andersen’s Fairy Tales – This website has links to Hans Christian Andersen fairy tales, games about the tales and information about the author himself. 7.) Time for Kids - Real life reading is the most important type of reading. Time for Kids provides kids with reading about today’s current events. There are real life articles on topics that interest children. 8.) 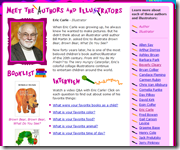 Reading Planet – Kids Books’ Authors – This website gives information about all of the best kids’ authors and illustrators. The information is written in interview format, which is a great for introducing kids to different reading formats. 9.) Giggle Poetry – Read and Rate – This site has hundreds of poems for kids to read and rate. It’s a great way to get kids excited about reading! 10.) Elementary Place – This website has many topics that interest kids. For each topic, there is a story where kids get to make the decisions, there is also an activity and a list of books about that topic. Informational Passages. These passages provide engaging information to students with a wide range of topics from which to choose. These passages help students learn about intriguing subjects while expanding their vocabulary and improving their comprehension skills. Short Stories. Students read a short story and answer questions about the story’s details. Each of the available exercises contains vocabulary and reading comprehension questions. EnglishForEveryone.orgThe materials available on this site are unique because they have been created by a team of award-winning teachers, professional writers and published authors. This exceptional staff enables this site to offer engaging content that is applicable to every ability level. The critical reading comprehension worksheets available here teach students how to think and read critically. Students read a passage and are then tested on their ability to understand scope, draw inferences, deduce the meaning of practical vocabulary words and find or recall details from the story. ReadTheory.orgThis site is the sister site to englishforeveryone.com. On this site, online quiz forms are available. There are exercises here that have been tailored for students who are reading at the high school-level or beyond. These exercises are especially helpful for those students interested in taking the standardized tests (SAT, ACT), as they mimic the way these tests format and present their questions. Scribd.comIt is essential for students to be able to read quickly and comprehend what is being read. If this skill is not mastered, a student’s life will be much more difficult. He or she will have problems learning in school, taking standardized tests, applying for jobs and more. Scribd.com offers reading segments to assist students in mastering their reading comprehension. Lit2GoThere are numerous reading comprehension exercises available on this site. Search options make finding the exercises you are looking for simple. These options include collections, books, authors, genres and readability. East of the WebThis site offers hundreds of stories for students to read online. Some of these stories are accompanied by reading comprehension worksheets that can be printed and used in the classroom. This site is aimed at students in grades K-8. UsingEnglish.comThis site allows teachers to browse stories by category. Following each story is a reading comprehension exercise. Users who register can access even more free materials. Super Teacher WorksheetsSuper Teacher Worksheets offers reading comprehension exercises for students from first-grade through middle school. The categories of content include biographies, fiction, non-fiction, poems and more. This site offers some free reading comprehension exercises, but teachers will be able to access more by purchasing a membership. For an individual yearly membership, the cost is $19.95. RHL School Reading ComprehensionThis website includes reading comprehension exercises in the form of poems, original stories, articles and essays. The site is best suited for students in grades 4-8. The site also offers short reading comprehension exercises tailored to specific skills. For instance, there are exercises that target a student’s skill at mastering word meanings from context, antonyms, synonyms and understanding inferences. Expository writing is a style used to present facts and ideas. Click the clipboard to reveal some writing samples and decide whether or not they fit the category of expository writing. Create a funny story by filling in the blanks with random words that correspond to the appropriate part of speech or prompt. It's normal to sometimes feel lost while writing an introduction to your essay or story. Practice 'marking the trail' of these introductory paragraphs and learn what clues to put in your introduction that will how to hold your readers' interest. This exercise helps writers 'lasso' the skills needed for writer a strong conclusion. Learn the difference between the prefixes 'pre' and 'post' by completing the sentences with the correct word. Feedback for all answers is given. Practice using various prefixes. Drag-and-drop them to complete the sentences. Will your language skills blossom or wilt? Control the flight of the Robo-Bee through a garden of synonyms, antonyms, spelling and word usage puzzles! You're the author of this unique dictionary, so you can decide which words belong in it. Fill in the boxes to submit the word. Here kids join together to help build a story block by block! Help finish a story by adding ideas. One week each month, a new story will begin. Post ideas for the middle and ending of the story. This reader's response activity can be used to analyze the character of any book. Play a crossword puzzle online. When you see the word that completes the analogy, click on the button at the bottom left of the screen. Move the bubbles up to the surface by guessing words that begin with the three letters provided. Focus on the key elements of a story: character, setting, conflict and resolution. It is easy to be a poet with this online magnetic word board. Drag and drop the prefixes to complete the words correctly. Pick the best definition for each capitalized word. Improve your vocabulary context skills. Build your vocabulary muscles with these online quizzes. Choose the correct word and earn rice for the United Nations World Food Program. Select a word, watch the video and then take the quiz. Identify different text types and why they are written in different ways. Identify all the essential parts of a letter, and then geneartor your own. Draw a picture to go with something you are reading. And then explain your drawing. Write your own diamond shaped poem. Go fishing with the gnomes to practice plural spelling rules. This online tool can help you create newspapers, brochures, flyers, and booklets. Drag the items from the top into the "Little" box or the "Few" box. Read the passage and choose the part that is a fragment. Practice using apostrophes to fill in for missing letters. Choose the correct form of the verb to complete the sentence. Get to grips with commas in your new job. Choose the correct answer to fill the gap. Answer the grammar questions correctly and earn rice for the United Nations World Food Program. Online Language Arts GamesThis large collection of online language arts games will help build skills and concepts for grades Pre-K through 12. Each link will take you to a fun and instructive game on FunBrain.com, an educational gaming site for kids. Your students, no matter what their age, are sure to enjoy these activities! Connect the DotsPractice numbers and the alphabet. Grammar GorillasThe parts of speech are reinforced. Sign the AlphabetAmerican Sign Language letters and numbers are reviewed. 2Bee or NottoobeeChoose the correct form of "to be" to finish the sentence. What's the Word?Click on the word that best describes the picture. Word TurtleStudents can design their own word searches. Order Me AroundThis game reinforces sequencing skills in science, vocabulary, and geography. Paint by IdiomMatching idioms with their correct definition is the goal of this game. The Plural GirlsStudents practice recognizing the correct forms of plurals. Scramble-saurusStudents unscramble words in many curriculum areas. Spell CheckRecognize and correct misspelled words. Stay AlfoatThis version of Hangman tests kids' vocabulary in all areas. Wacky TalesType in parts of speech to finish the story. Word ConfusionChoose the correct word to complete the sentence. Rooting Out WordsIdentify the roots of words.